Despite it’s reputation for swift rapids, Deception Pass isn’t all about whitewater. The park includes two freshwater lakes and two very wind and current protected and calm picturesque bays. Bowman Bay is located on the north side of the bridge and is adjacent to a camping area and water trails campsite. Bowman has both sandy beaches and rugged shorelines below madrone and evergreen forests. The bay has views of the distant Olympic Mountains, the Olympic Peninsula, Lopez Island and if clear enough, Victoria BC. 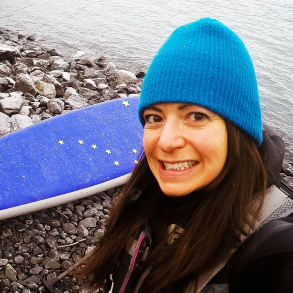 We’ll launch on a gently sloped gravel beach, then depending on your skills, either provide a basic lesson to new or inexperienced paddlers or start our tour. We have several options for routes. 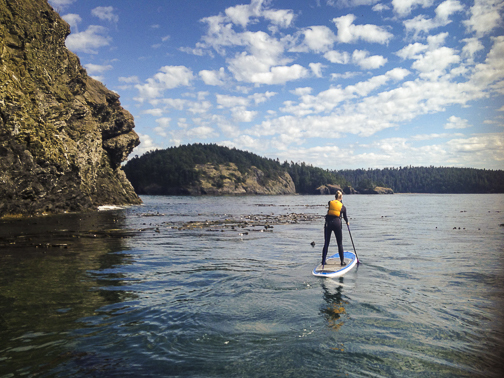 By heading to the right, we’ll paddle to Rosario Head and explore it’s cliffs and tide pools. Or we may head south towards Reservation Head and either portage a short sand spit into picturesque Lottie Bay which will provide us a view of the Deception Pass Bridge. And/or we’ll circumnavigate Reservation Head and explore it’s sandy pocket beaches, a sea cave, rock channels, tide pools and epic views of the Olympic Peninsula, Smith Island and the Strait of Juan de Fuca. Experienced paddlers can upon request experience light current if available on the outside of Reservation Head and Lighthouse Point. If you or your group has no or limited experience on a board beginning instruction will be included to get you up and paddling! Class Size: 1 – 6 people (Larger groups ok with advanced notice). Location: Bowman Bay, Deception Pass State Park, (or Cornet Bay if Bowman is windy). Duration: 3-4 hours. Paddle at your own pace, and we’ll take breaks. Guide to Guest Ratio: 1:4 or 2:4, 2:6. Tour Follow-up: Rob will shoot photos and/or videos upon request. Group Rate: 3-6 guests, 199 per person. Rental gear free with tour cost / 173 with your own gear. Two Person Rate: 225 per person. Rental gear free with tour cost. / 199 with your own gear. Individual Rate (1-1): 399. Rental gear free with tour cost. / 373 with your own gear. Rental gear includes: Stable board, paddle, PFD (life vest), leash, wetsuit, booties, gloves. Alumni/Repeat Tours: $25 off per person.